AFC Wimbledon can begin construction of their proposed new stadium at Plough Lane after signing an agreement with Merton Council. 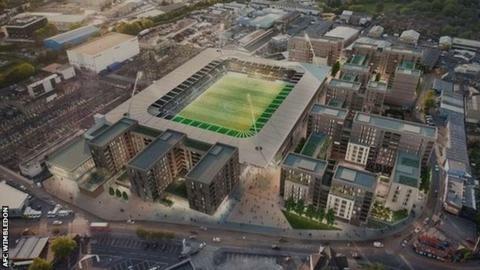 The League One club were granted planning permission in December 2015 to redevelop Wimbledon greyhound stadium. "This is a momentous day for us," chief executive Erik Samuelson said. "Everyone in football knows how AFC Wimbledon came into being. Now, 15 years later, we've taken a giant step towards going home to Merton." The Dons intend to build an 11,000-seater stadium, which could be expanded to hold 20,000, along with 602 residential units, retail and commercial space and a leisure club. AFC Wimbledon have played at Kingsmeadow, in Kingston upon Thames, since they were founded by supporters of Wimbledon FC in 2002. The original Wimbledon FC were forced to leave their Plough Lane ground in 1991 following the publication of the Taylor Report which, in the wake of the 1989 Hillsborough disaster, recommended that top-flight sides should play in all-seater stadiums. They shared Selhurst Park with Crystal Palace until 2003 when they moved to Milton Keynes, having been given permission to relocate by an independent commission a year earlier. The club were subsequently renamed MK Dons, while their old Plough Lane home became a residential development. AFC Wimbledon had two main aims upon their foundation: to return to the English Football League and to move back to Merton, which they see as the club's spiritual home. They won five promotions in nine years to reach the Football League in 2011 and then won the League Two play-off final in 2016 to reach the third tier. AFC Wimbledon took over the leasehold of Kingsmeadow in March 2003 and have agreed to sell the ground to Premier League side Chelsea.